My 12 year old son's good friend just returned with his family from a western Mediterranean cruise. Alas, what kind of traveler am I, as I have never been on a cruise? I would like to, very much, but for now I can only report to you the experience of our little friend, Logan (not his real name), and his opinions on cruising Europe with as a kid. Logan's family includes himself, who is exactly my son's age, his parents, and his sister, who is, conveniently, exactly my daughter's age (15). 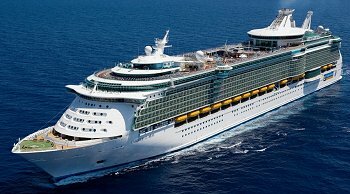 They flew to Barcelona to board the Royal Caribbean International Liberty Of The Seas for a 7-night roundtrip cruise. Ports of call were: Barcelona, Spain; Toulon, France; Nice, France; Civitavecchia (Rome), Italy; and Naples, Italy. To Europe With Kids: Did you have a great time? Logan: It was one of the best trips I've ever been on. There was lots of educational stuff but it was still fun. To Europe With Kids: Did you spend any time in Barcelona and whaddja' think? Logan: Barcelona is overrated. I thought it was kind of dirty. We were there two nights. But they had the best gelato I've ever eaten. To Europe With Kids: Do you know who Antoni Gaudí is? To Europe With Kids: What was your favorite activity on the cruise ship? Logan: Definitely the Flowrider. It's a wave pool where you can surf or boogie board. But I also liked the movie theater, the rock climbing wall, and the ice skating rink. To Europe With Kids: What was your 15 year old sister's favorite thing on the ship? Logan: Laying in the sun. To Europe With Kids: Did you two hang out together or was she too cool for you? Logan: She was all right. To Europe With Kids: Did you feel comfortable and safe walking around the ship by yourself? No worries about getting lost or abducted? Logan: Well, since our cell phones didn't have service, we brought walkie-talkies to keep in touch with each other around the ship. That was a good idea. To Europe With Kids: Any impressions about the cities you visited in Europe? Logan: The street performers in Europe are awesome! They do the coolest things! Italy was okay but over 100° (Fahrenheit) every day. We spent a lot of time in that big museum by that big church in Rome (the Vatican Museums) to try and keep cool. To Europe With Kids: What did you think about Paris where you spent a couple of days after your cruise? Logan: I loved the crêpes. I got them with Nutella, bananas, almonds, and coconut. We stayed at Citadines and it was right across the street from the best crêpe place. To Europe With Kids: Anything else? Logan: Yeah. In Paris they have these random square things on the street corners where you push a button and a door opens and there's a toilet inside. Weird. Disclosure: Although I had to pay Logan $5.00 for the time the interview took away from his video game, all opinions are honest and his own. I also had to pay my son $5.00 not to be embarrassed by my asking to interview his friend. We did a very similar cruise with some of the same stops, but not with kids - it was interesting to see it from a kid's point of view! Thanks for sharing! I love it that is so funny. No wonder he thought Barcelona was lame, he doesn't know who Gaudi is!! Seems like someone should have mentioned this to him!